Chris Johnson. Photo ©Yuki Naito. Tuesday, February 10 at 6:30 p.m.
Japan Society welcomes back certified sake sommelier Chris Johnson to lead a special workshop on romantic sake cocktails. Participants will shake up their Valentine’s Day menu by learning about different varieties of sake and how they can fit into any mixologist’s cocktail-making repertoire. 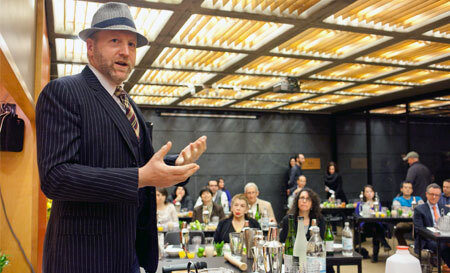 Under Johnson’s guidance, each participant will mix and enjoy several Valentine’s Day-themed sake cocktails. The cost of admission includes cocktails, snacks, and a cocktail-mixing set for applying Johnson’s teachings at home. Participants must be at least 21 years old.